Cartridges loaded with Sierra MatchKing bullets have been winning shooting competitions for decades. 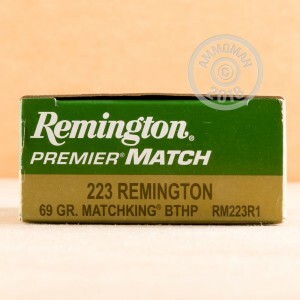 Remington Premier Match brings the creator of the .223 cartridge together with Sierra's famous bullet to create the ultimate accuracy-oriented ammunition. These rounds deliver a muzzle velocity of about 3,000 feet per second with a 69 grain projectile and exhibit good stability in flight due to the boat tailed design. 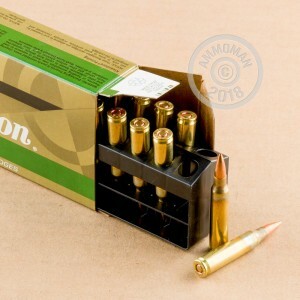 Match grade ammo can be a bit spendy, but AmmoMan.com can help. Buy this 200 round case to instantly qualify for free shipping (applies to all orders over $99).